As a home cook, I not only enjoy trying new recipes, and experimenting with new types of food, I also enjoy refining old favorites. 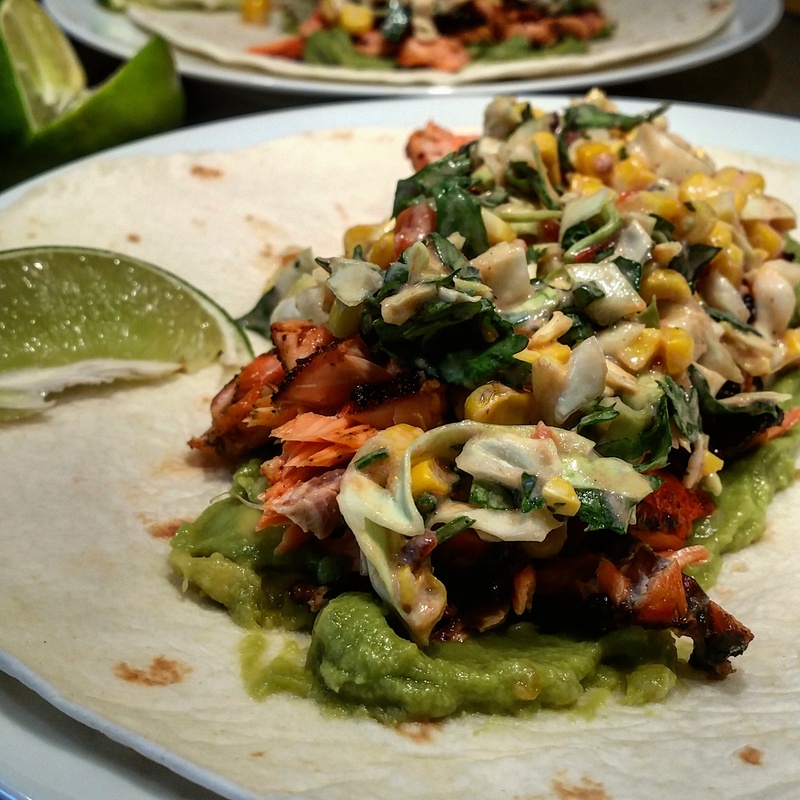 The following is a new twist on one of our household mainstays: the salmon taco. You’ll notice that many of our favorite flavors are at play here – chipotle, cilantro, and cumin, etc. – but I’ve changed around a few things as well. I’ve made some additions to my favorite salsa slaw recipe, and refined my salmon rub as well. I’ve made different versions of this recipe in the past (1) (2) (3) but I think this one is a new favorite! Preheat the grill over high heat. Place the shucked corn cobs on the grill, drizzle with a little oil (watch for flame-ups), season with a pinch of salt and pepper, and grill the corn over high heat for 5-8 minutes (turing frequently) to give the kernels a nice sear. Remove the corn from the heat once the kernels are cooked through and have a little char to them. In a small bowl, mix the sugar and spices together for the rub. 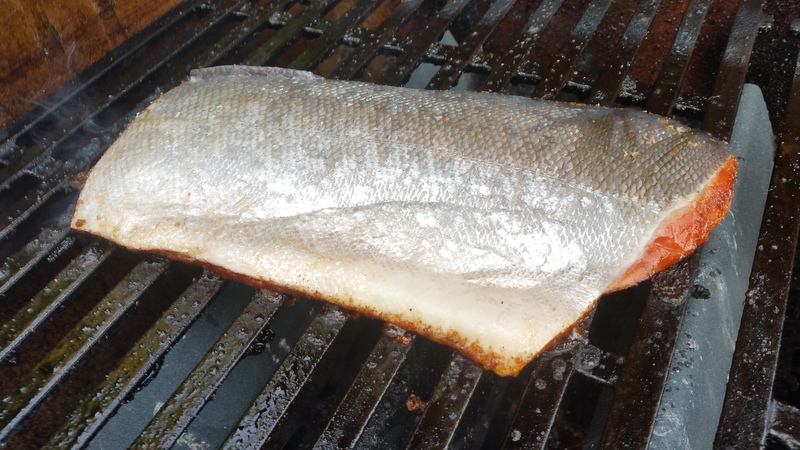 Once the grill is hot, place the fillet on the grates flesh side down. Sear the salmon for 2-3 minutes over high heat. The sugar will caramelize, coating the fish in a shell of sweet and spicy flavor. Flip the fish onto the skin side, reduce the heat to medium-high, and continue to cook until it reached your desired level of done-ness. For me, it takes about another 5 minutes. With a large kitchen knife, cut the kernels off the cobs, and put them in a mixing bowl with the other slaw ingredients. Toss the ingredients together, and season with salt and pepper to taste. Assemble the tacos on tortillas of your choice with a layer of guac, a layer of flaked fish, a large spoonful of slaw, and a squeeze of lime. Yum!! Love the bit of cinnamon and brown sugar in he rub!! This sounds like a flavor explosion. Yum! I could eat these every day! We love the same flavors, obviously! Hello. I did just nominate you for the Dragon`s Loyalty Award. I love your blog and I think we definitely have two things in common: the love to good food and beer 🙂 You can read about the nomination in my last post! Thank you so much! I really appreciate it! Cheers to good food and beer! You are very welcome. I enjoy reading your blog a lot!